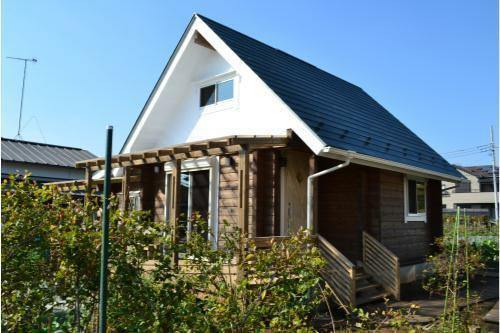 This is two-storied log cabin built in Fukushima prefecture. Using 150mm big framed Japanese cedar log, we completed with great volume. We separated terrace and balcony by cedar timber frame to make the exterior appealing. Inside the house are made with many domestic woods. Japanese cypress for flooring, Diatomaceous earth coating for ceiling, and Japanese cedar for climbing beam and furniture. 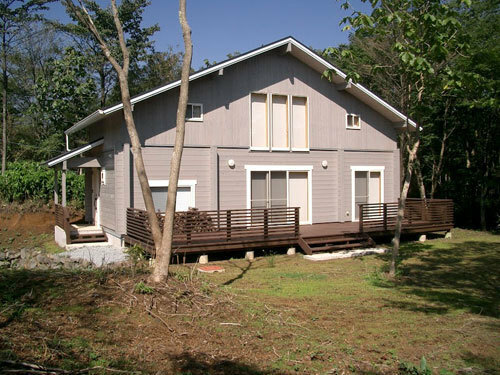 This is a flat log cabin built in a farmland of Sagamihara City, Kanagawa prefecture. For the exterior, we used protective layer called “Wood Long Eco” that is popular for making wood looking old, and this is making the look of the house beautiful with the white wall on upper side. 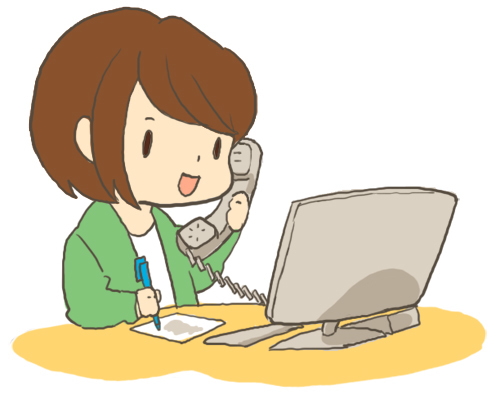 There is a pergola with the terrace so there is a space to take a rest or work outside. In inside, we attached a simple loft so you don’t have to worry about the resting place for the visitors. We made a kitchen with a high counter, and to match with the log cabin, pine is used as the material. 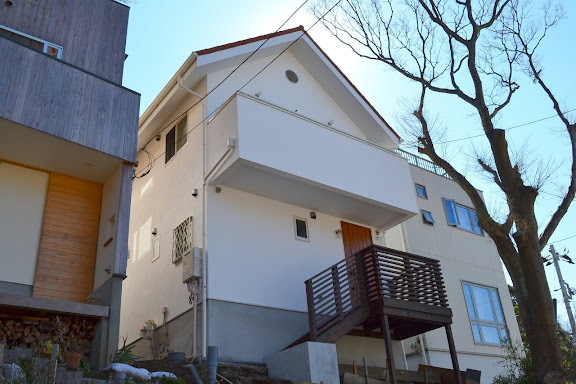 This is two-storied conventional framing structured house at Kamakura city, Kanagawa prefecture. For the exterior we used pure white plaster to make beautiful contrast with the wooden handrails besides the door. Inside the house, wall is all wooden panel so you could feel many great effects of woods. There is a rope hang from the ceiling by the request of the client so that they could enjoy rope climbing as a hobby. 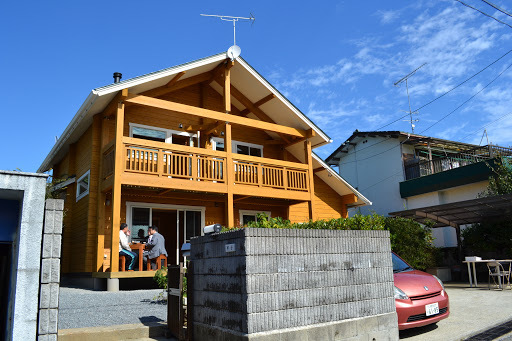 This is a log cabin built in Oiso town, Chu-gun, Kanagawa prefecture. Garage is connected with the house with conventional framing structure and it became a space to enjoy cars and bikes. Also, a loft is made inside so it is able to use as storage or a small room. Large space for living room, dining room, and kitchen, but you can always separate them with 3 sliding doors. 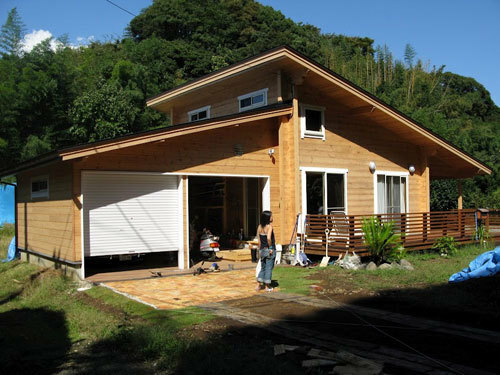 This is a villa built in Susono city, Shizuoka prefecture. First floor is square log cabin made with red cedar. There placed a big living room, dining room, and a kitchen that gets a lot of sunshine. Second floor is for bedrooms and Japanese style rooms, and the stairs to the upstairs are made spiral, making the space look special.